Check back for regular updates and don't hesitate to get in touch - we 'd love to hear from you. VIDEO - Siobhán appears regularly with a 17 piece Belfast-based big band - watch video footage here of a recent concert performance in The Waterfront Hall, Belfast. NEW FEATURE - You can now download Siobhan's music from this site using Paypal or credit card. Click HERE to go to the downloads page. 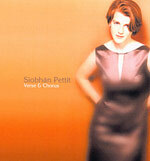 ALBUMS - Long Ago Tomorrow and Verse & Chorus, Siobhán's two studio albums are both available for sale from this site using credit card or Paypal. Click here to buy.